Today we will talk about a small tool which lets you scan all your privacy settings and after the scan, it gives you adviceÂ on what to do along with the consequences of present configuration e.gÂ if your photos , data etc is exposed to outer friends circle or search engines etc. To use this tool from http://www.reclaimprivacy.org/, you need to just bookmark it on your bookmark bar by dragging a small button from this page. After you added that button, just go to Facebook and login there. 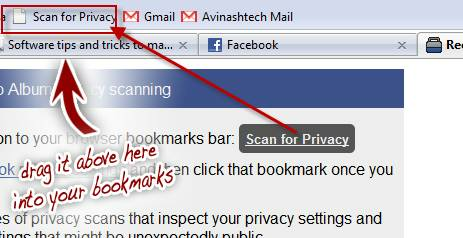 After that, just click the “scan for Privacy” button and it will scan all your settings. In few seconds , it will advise you about your settings. Here is what it turned out to be for my settings. This simple scan tells a load about our settings and what should we do if we are not comfortable about it. Just check this tool and scan your settings if you are concerned about your privacy. Just use it and change your default options if required.